Unite’s period dignity campaign is spreading like wildfire as more and more workplaces sign up to provide free sanitary products in toilets – since its launch in September last year dozens of firms and organisations have committed to the initiative. And now, the campaign is being rolled out globally after Rolls-Royce announced it would provide sanitary products at no cost in toilets across its operations in 50 countries around the world. It all started when Unite convenor at Rolls-Royce Washington Gary Andrews spearheaded the initiative locally at the plant in Sunderland. 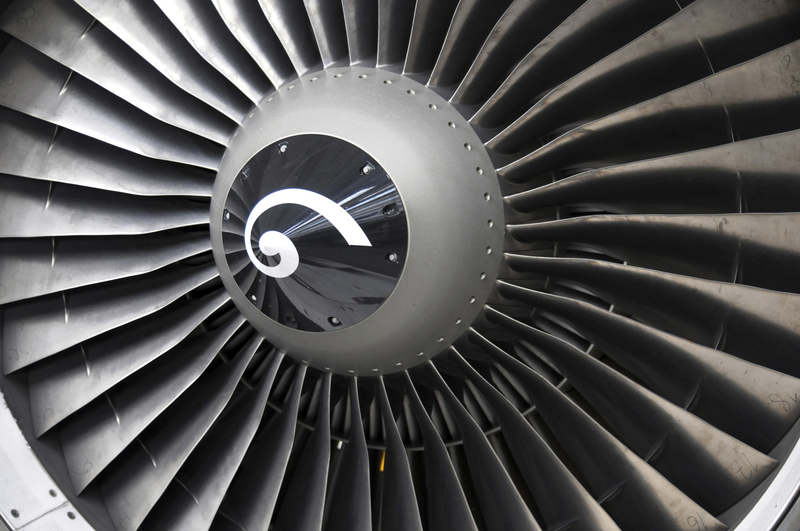 Rolls-Royce Washington was the first to sign up to Unite’s campaign in September. Motivated by the success, Unite reps began raising the issue with senior management across Rolls-Royce – and now thanks to the union’s campaign, Rolls-Royce staff throughout the world will have access to free sanitary products. Gary told UniteLive that he was ‘chuffed to bits’ by the news that the initiative would be rolled out globally. “It is fantastic news that Rolls-Royce will be giving its global backing to Unite’s period dignity campaign and be providing sanitary products in toilets across its operations around the world at no cost,” he said. Gary noted that he was very proud about the unanimously positive reaction prompted by Rolls-Royce Washington first adopting Unite’s period dignity charter – the enthusiasm in part was what motivated Rolls-Royce to go global. “When I approached the global HR manager to discuss rolling out the campaign nationally he agreed, but then later he came back to me and said, no, we can’t stop nationally. We’re a global company so we should do this worldwide,” Gary explained. While it is unprecedented for a global company to provide free sanitary products at all its facilities across the world, Gary said it’s “simply the right thing to do”. “In today’s world no woman should feel uncomfortable about their period. It has been a taboo subject for too many years,” he said. Just as Gary noted, Rolls-Royce itself also said that its decision to take up the campaign globally started from the “positive reaction” at its Washington site in Sunderland. “We are focused on creating an inclusive environment for all of our employees to be at their best,” a company spokesperson said. While Gary said he was “proud as punch” about the campaign’s latest achievement, he noted that it “should only be seen as the beginning”. He also hopes the success Unite has had with its period dignity campaign will push the government to once and for all end the so-called “Tampon Tax”, which Gary called a “national embarrassment”. Gary hailed Unite’s role in advancing the period dignity campaign, which started as a local initiative in the North East Yorkshire and Humberside region, developed with the help of Unite regional officer Suzanne Reid, but is now a union-wide campaign. 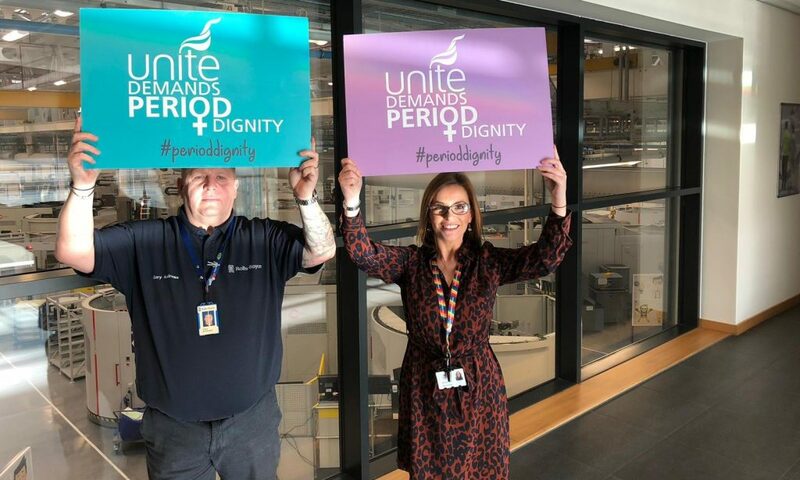 Unite national officer for equalities Siobhan Endean praised Rolls-Royce for taking a “progressive step and leading the way in being the first global company to sign up to Unite’s period dignity charter. “Having a period is a natural process that should never be a source of awkwardness,” she added. “Unite believes that by changing perceptions we can tackle some of the wider issues around periods.